So said National Taxpayer Advocate Nina Olson at a House Ways and Means Oversight Subcommittee hearing, during which she was praised for her 18 years of ombudsman work that will end when she retires on July 31. Preliminary data on the four-week-old 2019 filing season show that taxpayer assistance telephone lines properly routed only 57 percent of millions of phone calls received, with assistors providing answers to only 18 percent, Olson said. These figures are “both substantially down from last year’s levels,” she testified. During the first week after the Dec. 22-Jan.25 partial government shutdown, the agency’s phone line for taxpayers who wish to negotiate payment of taxes owed routed inquiries correctly at only a 6.7 percent rate, “meaning 93.3 percent of the calls from taxpayers trying to make payment arrangements were not answered,” Olson said. “By Jan. 24, 2019, the final day of the shutdown, the IRS had over 5 million pieces of unprocessed mail, 80,000 responses to fiscal year 2018 earned income tax credit audits that had not been addressed, and 87,000 amended returns waiting to be processed,” she said. “When we can’t process correspondence, that drives people to call us more,” she said, “so the endless cycle goes on.” While the agency has gained efficiencies from more taxpayer use of online tools, “the only way to solve it is to have more employees working those calls and answering correspondence,” she said. Having released what will be her final annual report on Feb. 13, Olson—who was among the employees “excepted” during the shutdown—said she was in contact with other non-furloughed agency officials daily during the lapse. The IRS anticipates that it will take 12-18 months to catch up from the lost work, she said, with effects spilling into the next filing season. The perennial issue of how the IRS can modernize its decades-old computer system was raised by Rep. Jackie Walorski, R-Ind. 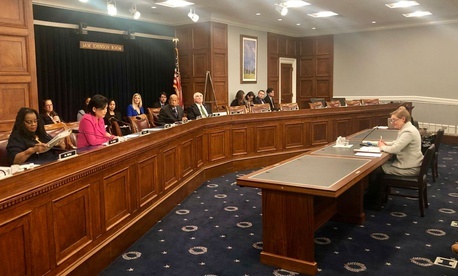 In the previous Congress, “we found that much of the waste was not the result of budget limitations, but mismanagement and poor administration,” Walorski said, calling on the IRS to prioritize better and cease procurements that are boondoggles. “It should spend what it already has before we give it new money,” she added. Olson agreed partially. Yes, the tax agency managers should be “honest about their challenges and not whitewash them,” she said. And procurement problems back in the 1990s were a key reason for waste. The agency “needs accountability and transparency, but I do think it needs more money,” though not “a blank check,” she added. Olson called for “dedicated funding for a big leap to replace its core system records of taxpayer accounts” that still uses systems that go back to the 1960s. Currently “no one has a 360-degree view” of different taxpayer records, and too much “custom programming” means money goes “down a sinkhole,” she said. Ranking subcommittee member Mike Kelly, R-Pa., asked Olson for support of reviving the Republicans’ “Taxpayer First Act,” which came close to passing with bipartisan support in the last Congress, and would reorganize the agency to put focus “back on customer service,” Kelly said.